may have co-created Peter Porkchops and Peter Panda) and illustrated by animator Joe Oriolo (a protegé of Felix the Cat creator Otto Messmer, and mostly famous for TV cartoons about Felix). It's unclear whether the idea for the story came from Reit or Oriolo. The cartoon was directed by Isadore Sparber and released by Paramount's Famous Studios, as part of its "Noveltoons" series, in 1945. This sentimental tale of a ghost who didn't want to scare anyone was well enough received to spark a sequel, There's Good Boos Tonight (1948), also directed by Sparber. This led to a full-blown series, some directed by Sparber and some by Seymour Kneitel. During the 1950s, Casper cartoons, which all had more-or-less the same plot, followed one upon another with monotonous regularity, outlasting all his Famous Studios contemporaries except Herman & Katnip. The last theatrically-released Casper cartoon was Casper's Birthday Party, released July 31, 1959 and directed by Kneitel. Casper was unusual among Famous Studios characters, in that he wasn't a knock-off of something else. Little Audrey was a transparent copy of Little Lulu; and Herman & Katnip were obviously cribbed from Tom & Jerry. And although Baby Huey and his family eventually became better known than Chuck Jones's version of The Three Bears, the Jones creation came first. But Casper was Casper, and not a copy of anything else. In fact, he spawned several comic-book imitators of his own, including Ajax's Spunky the Smiling Spook, Marvel/Atlas's Homer the Happy Ghost and Charlton's Timmy the Timid Ghost. ACG's Spencer Spook was too early to be an actual knock-off, but probably owed much of his longevity in the marketplace to Casper's popularity. In 1949, Casper became a comic book character, when St. John Publishing secured the rights to do all of Paramount's cartoon characters in that venue — and by the way, it was in St. John's Casper the Friendly Ghost #1, September 1949, that Casper first received his actual name. In 1952, the license was transferred to Harvey Comics, which bought the characters outright in the late 1950s. Casper's comics far outlasted his theatrical career — they were published regularly until 1982, and sporadically since. It was in the comics that he acquired his family, The Ghostly Trio; his ghost horse, Nightmare (no relation); and additional supporting characters such as Spooky the Tuff Little Ghost and Spooky's girlfriend, Poil. It was also in comics that he made friends with Wendy the Good Little Witch, who later anchored her own Harvey Comics series. 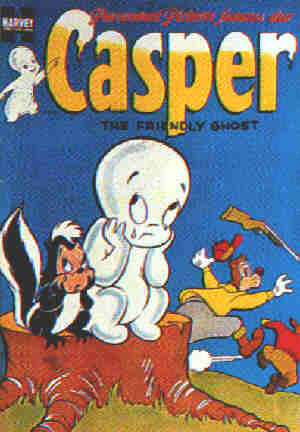 When, in 1963, Casper's first made-for-TV cartoons appeared, the supporting cast from the comic books came with him. With them adding to the dynamic, Casper was no longer the one-note character he'd been back at Famous Studios. It was now possible to play characters off of one another, and do a variety of different types of story. But when his live-action feature film came out in 1995, all that went by the wayside. Except for a couple of walk-ons by The Ghostly Trio, every character but Casper himself disappeared. Although the story was as complex as it needed to be to fill out the length of the film, in essence, it had the same plot as Boos & Saddles (1953), Line of Screammage (1956), Hooky Spooky (1957), or any number of other 1950s Famous Studios releases. Does this represent regression? Or is Casper finding his "roots" in a simple, basic, sentimental story, without a lot of paraphernalia? Time will tell — if there is one thing about Casper of which we are certain, it is that he has staying power. Text ©1999-2010 Donald D. Markstein. Art © Harvey Entertainment.